Vichy Liftactiv, complete hydrating and firming action for the skin. The formulation is enriched with Rhamnose 5%, a naturally derived active ingredient that is a driving force of epidermal skin cell and skin fibre renewal. Skin immediately feels lifted, smoothed and firmer, with a boost of radiance and hydrated. 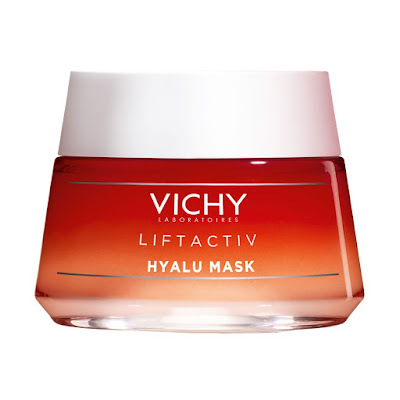 Achieve a smoother and more even skin tone instantly with the Vichy LiftActiv Hyalu Mask, a powerful hyaluronic acid-rich mask that will restore skin suppleness and unify the complexion. An at-home facial in a pot, the LiftActiv Hyalu Mask will help to improve the tone and elasticity of skin with its light gel texture and incredibly fresh feel. Its 100% pure hyaluronic acid-infused formula promotes a plumper look and skin that feels instantly hydrated, softer and smoother. After the very first use use you should see a difference. Achieve a younger-looking complexion with the Vichy LiftActiv Collagen Specialist, a skin energising moisturiser for all skin types that will stimulate fibroblasts and boost vital collagen production. 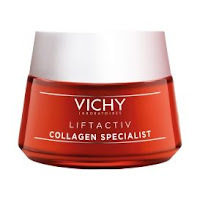 This innovative day cream from Vichy is designed to firm skin, enhance radiance and reduce the appearance of fine lines and wrinkles, creating a more smooth and even complexion. Immediately, skin becomes more plump and toned, and over time it will be regenerated with a more youthful appearance. 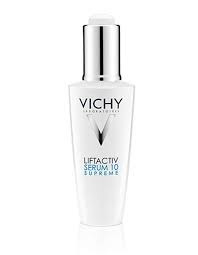 Transform the youthful look of your skin with Vichy LiftActiv Serum 10 Supreme, Vichy’s most powerful firming serum. As skin ages it recovers more slowly from daily aggressors, which can lead to accelerated appearance of ageing including wrinkles and a loss of firmness. This supercharged serum works to target 10 signs of ageing, from signs of fatigue and dullness, through to fine lines and a loss of plumpness. At the heart of the formula is a 10% concentration of rhamnose, which helps to accelerate surface skin cell renewal, whilst hyaluronic acid and fragmented hyaluronic acid works to hydrate and plump the skin. After use skin looks firmer, lifted and smoother, for a more youthful result. 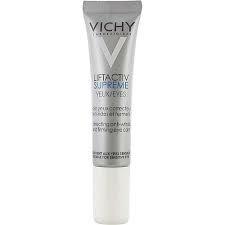 Target signs of ageing as they appear with Vichy Liftactiv Supreme, advanced smoothing and firming care for normal to combination skin. Liftactiv Supreme is created for those concerned about the onset of fine lines and a lack of firmness; signs of ageing that appear to intensify over the day as fatigue sets in. This complete daily moisturiser improves the youthful look of your skin by tackling immediate signs of fatigue whilst working to diminish signs of ageing over the long term. To achieve instant soft-focus radiance, this unique formula is enriched in 3D optical correction technology that transforms the surface of skin, created from blurring particles, mattifying powders and white micro-pearls that smooth and illuminate. 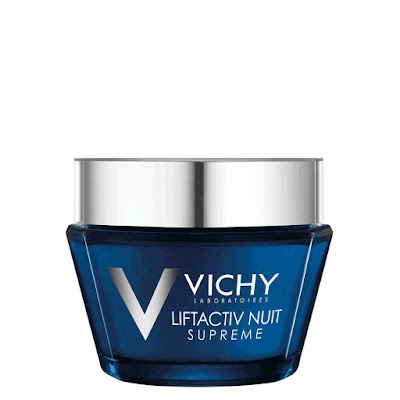 Get complete anti-wrinkle and firming protection for skin during the night with Vichy LiftActiv Night Supreme. The exclusive formulation is enriched with Rhamnose 5%, a naturally derived active ingredient that is a driving force of epidermal skin cell and skin fibre renewal. Skin immediately feels lifted, smoothed and firmer, with a boost of radiance and a reduction of wrinkles. 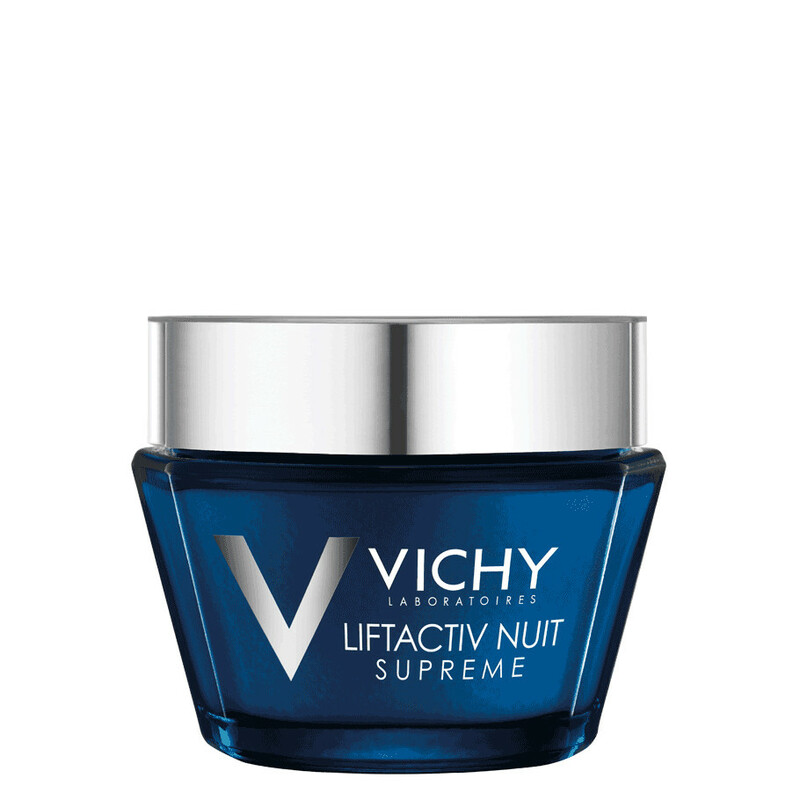 With a light and fresh fragrance and a comfortable, non-greasy, non-sticky texture, Vichy LiftActiv Night Supreme soothes and enriched skin beautifully. 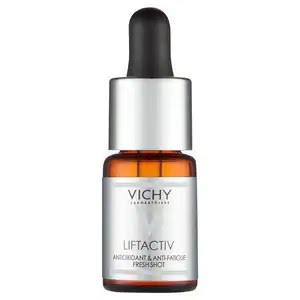 Boost your skin’s natural glow in just 10 days with the Vichy LiftActiv Vitamin C Brightening Skin Corrector, a radiance boosting treatment that combats dullness and loss of firmness. Infused with Vichy’s highest concentration of pure vitamin C at 15%, the LiftActiv Vitamin C Brightening Skin Corrector delivers a potent dose of antioxidant and anti-fatigue care to the complexion. In addition, this rejuvenating treatment is enriched with vitamin E and fragmented hyaluronic acid to hydrate and smooth skin whilst combating oxidative stress and improving overall skin health. Designed to show visible results in just 10 days, the revitalising formula is non-sticky and penetrates quickly, resulting in skin that is more luminous, youthful and firm. Rejuvenate the eye contour with the Vichy LiftActiv Supreme Eyes cream, an advanced formulation that utilises innovative Vichy technology for younger looking eyes. 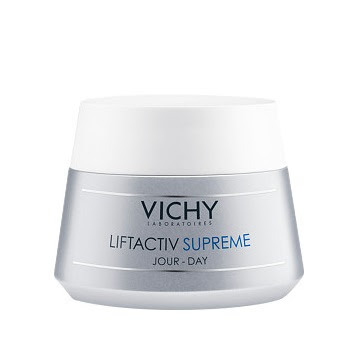 The LiftActiv Supreme Eyes cream provides four transformative actions: eyelids are lifted and firmed, dark circles are eradicated, eye bags are decongested, and wrinkles are reduced. A derivative of horse chestnut seed – insoluble in water – stimulates the lymphatic nodes and helps decongest bags under eyes. The caring formulation is further enriched with rhamnose, caffeine and escine to help smooth fine dehydration lines and promote a more vital looking eye area. 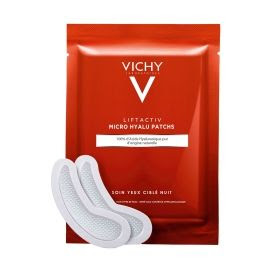 Revive your eye area with the powerful Vichy LiftActiv Micro Hyalu Patches, a set of hyaluronic acid-rich patches to target and visibly improve signs of ageing around the eye contour. Created as an alternative to invasive treatments, the LiftActiv Micro Hyalu Patches provide impressive anti-wrinkle transformation after just one use. Lines appear smoothed and the eye contour is refreshed and rehydrated. Each eye patch contains 160 micro-needles that will gently dissolve into the skin’s surface and deliver a targeted dose of 100% pure hyaluronic acid more deeply than a topical treatment. This breakthrough transepidermal diffusion technology means that skin is more effectively plumped and smoothed from within, which softens the appearance of wrinkles and makes the eye area look more youthful. These innovative patches attach to the skin using medical adhesive, making them suitable for both sensitive skin and eyes.